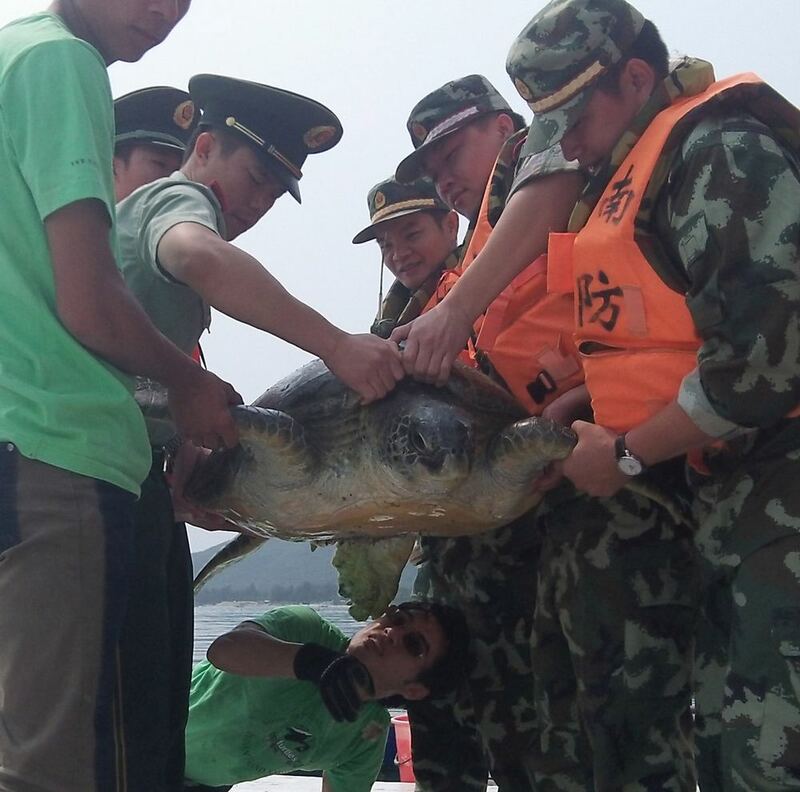 On March 26, 2012, Sea Turtles 911 successfully released a sea turtle with the assistance of the Chinese coast guard police. 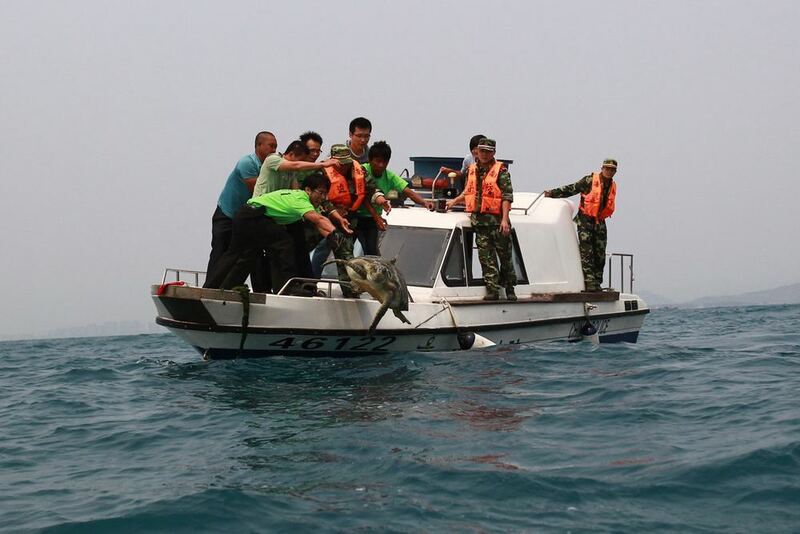 Due to the large amount of fishing nets in local waters, police boats were taken a predetermined distance outside the bays for the safest possible release of the turtle back into the sea. Other witnesses of the event included government officials, local fishermen and their families, volunteers, and a group of students participating in an educational school field trip program with Sea Turtles 911. Chinese police lift sea turtle up as Frederick Yeh performs a health inspection prior to release. The turtle released was an endangered Green sea turtle (Chelonia mydas) named Starblu. An adult female, she weighed approximately 120 kg (265 lbs) with a shell length of 1 meter, a size that categorizes her as a breeding adult. A local fisherman caught Starblu accidentally as by-catch in a fishing net. As she was trapped for an extended period of time before being found, she fell into a coma. Acting quickly, the fisherman alerted local police who immediately contacted Frederick Yeh, Founding Director of Sea Turtles 911, seeking assistance with her rescue. She was transported directly to the organization’s floating sea turtle hospital where she was carefully monitored prior to release. This sea turtle’s release was particularly significant in that she was outfitted with two types of research tags on her flippers and on top of her shell, in order to further international sea turtle conservation. Flipper tags were funded by HNA Group, the parent company of Hainan Airlines. The satellite transmitter tag was made possible by collaboration with the U.S. National Oceanic and Atmospheric Administration (NOAA) in Hawaii. Currently, very little is known about the movements and behaviors of sea turtles in Chinese waters. These research tags will provide information that will inform biologists where Green sea turtles in the area are migrating from, where they forage for food, and where they nest. This research data will provide evidence for locations where more effective conservation efforts are necessary for endangered sea turtles. Sea Turtles 911 rescues sea turtles from the illegal turtle trade, rehabilitates them as necessary, and then releases them back into the sea, in an effort to keep these ecologically important creatures from extinction. They also provide community education and ecotourism programs to benefit local economies and create an international awareness of sea turtle issues.